EOS is a solar-powered diffuser that automatically adjusts to horizontal or vertical configuration. Logic system monitors air temperature and adjusts the air discharge position using harvested power to complete auto-changeover function. 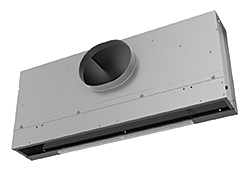 Plenum slot diffuser changes discharge pattern to the correct horizontal or vertical position for heating and cooling applications.